Reality TV stars Kendra Wilkinson and Tori Spelling are lumped together for the cover of the new issue of “Life & Style” magazine. 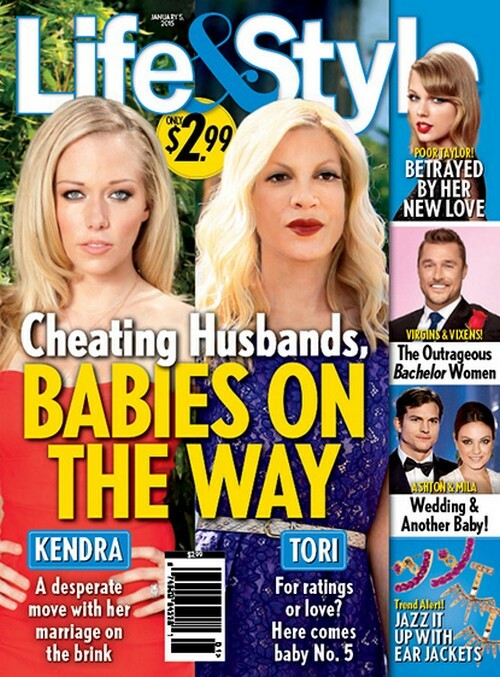 In this issue, the tabloid claims that both Kendra and Tori are knocked up by their cheating husbands. Kendra has made a desperate move with her marriage to Hank Baskett on the brink of destruction. Meanwhile, Tori is said to be pregnant with her fifth child and it all boils down to ratings for her reality show. We’ve heard rumors in the past that Tori and Dean were in some deep trouble financially, so another kid just means another mouth to feed and that equals trouble. Are you buying any of this? I guess only time will tell!